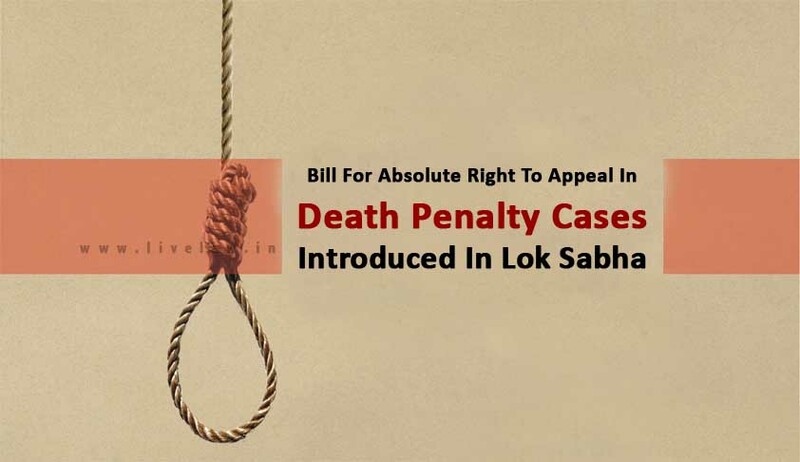 A private member bill, 'The Constitution (Amendment to Article 134) Bill, 2017', to ensure natural and unrestricted right to appeal in the Supreme Court in all cases of death penalty, was introduced in the Lok Sabha on Friday, by Member of Parliament, Mr. B. Vinod Kumar. “Through this Bill, my intention is to ensure that every convict, who has been awarded death sentence by the lower court and the High Court, should have the right to move the Supreme Court without any hassle or legal impediment. While the Supreme Court grants the right to appeal in relatively milder and ordinary cases, there is no provision for such rights to be exercised in the context of capital punishment. I believe that this right to appeal in the Apex Court should be natural and drawn from the Constitution itself. This implies that the exercise of this right should not be subjected to the approval or disapproval of the Supreme Court. In the question of life and death, the right to appeal to the Supreme Court should be unrestricted. For this, through this Bill, I propose to amend the Constitution to extend the appellate jurisdiction of the Supreme Court to all death penalty cases,” a press note released by Mr. Kumar said. Article 134 of the Constitution of India, 1950 provides for an appeal to the Supreme Court from any judgment, final order or sentence in a criminal proceeding of a High Court if (a) it has on appeal reversed an order of acquittal of an accused person and sentenced him to death or (b) has withdrawn for trial before itself, any case from any Court subordinate to it and has in such trial convicted the accused and sentenced him to death or (c) it certifies that the case is a fit one for appeal to the Supreme Court. Hence, there is, at present, no right of appeal to a death sentence if the accused was concurrently convicted by the courts below. The accused has to only try his chances by invoking the discretionary power of the Supreme Court under Article 136, which allows the Court to dismiss such death sentence cases in limine, i.e. without admitting it for a hearing on merits, or without recording reasons for such dismissal. The press note then refers to two reports- one submitted by the Death Penalty India Report by National Law University, Delhi, and the other titled report entitled ‘Lethal Lottery’ prepared by Amnesty International and People’s Union for Civil Liberties, to support its contention that several Special Leave Petitions have been dismissed by the Supreme Court in limine. It further makes reference to the 187th Law Commission Report on Mode of Execution of Death Sentence and Incidental Matters, and the 262nd Law Commission Report on the Death Penalty, which had recommended a statutory right to appeal before the Supreme Court in all death sentence matters. The Bill, therefore, seeks to expand the appellate jurisdiction of the Supreme Court, providing mandatory appeals when death sentences are confirmed, and when sentences are enhanced to the death penalty by High Courts. It is interesting to note that a similar Bill was introduced by Mr. Atal Bihari Vajpayee in April, 1987. It was however withdrawn on the assurance of its consideration by the then Minister of Law, Mr. H.R. Bharadwaj. The Bill, however, never saw the light of the day. 30 years later, it has now been introduced as a Private Member Bill by Mr. Kumar. Mr. Kumar also introduced the Orphan Child (Provision of Social Security) Bill, 2016 on Friday, along with the above mentioned Bill. This Bill seeks to provide a comprehensive policy for the welfare and reservation of orphan children in India, and makes it obligatory for the State to provide care, shelter and succour to these children. The Bill establishes a welfare fund, known as the Orphan Welfare Fund, with an initial corpus of Rs. 2,000 Crore. It further mandates the Central Government to provide 3% reservation for orphans in education and employment.